The Swoosh continues to raise the bar for the Lunar Flyknit Chukka with this impressive Green/Black-Orange colorway previewed here today. The extremely versatile runner is hit with a blend of green and black over their lightweight Flyknit upper. Orange Swoosh logos help create a classic Miami Hurricanes inspired color scheme, matching the laces, tongue branding and heel pull tabs. As usual, we see a white Lunarlon sole sitting below. 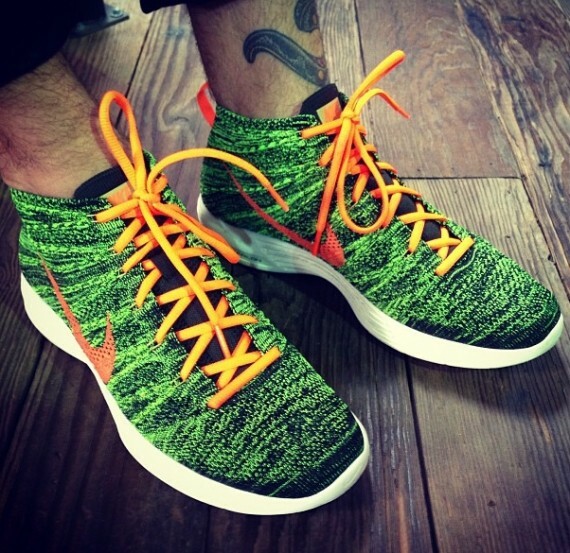 Stick with Sole Collector for further details on this Green/Black-Orange Flyknit Chukka by Nike.